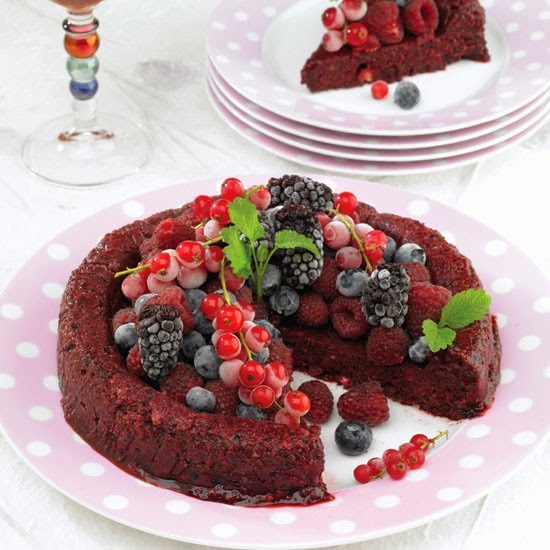 Summer pudding is a traditional English dish in which all the wonderful summer berries and currants are packed into a bread casing that absorbs all their sweet juices and turns deep red. This is a frozen, very low-calorie variation. Preheat the oven to 375°F (190°C). Line a 2-pint ring mold with plastic wrap and place in the freezer. Place the breadcrumbs on a baking pan with the sugar. Roast in the preheated oven until golden and crispy, stirring once or twice so they are thoroughly crisp. Set aside until completely cooled. In a food processor, whiz the frozen fruits until well blended and pulpy but not softened. Quickly stir in the toasted breadcrumbs and the allspice. Spoon into the cold ring mold. Smooth the top, cover, and freeze until firm or until ready to serve. To serve, invert onto a serving plate, remove the plastic wrap, and top with berries and a few fresh mint leaves. Serve immediately with low-fat crème fraîche or fromage frais. This dessert can be kept in the freezer (in or out of the ring mold) for 3 or 4 months, covered with plastic wrap and foil. Remove from the freezer about 15 minutes before serving. Prepare the basic recipe, using only red fruits — strawberries, cranberries, and red currants — and adding extra sugar or sweetener if you wish. Prepare the basic recipe, this time using only currants — black, red, white — and adding extra sugar to taste. Prepare the basic recipe, replacing the summer fruits with peeled, sliced, and frozen apples, pears, and plums. Replace the allspice with ground cinnamon. Prepare the basic recipe, replacing the summer fruits with equal quantities of apples (peeled, cored, sliced, and frozen) and frozen blackberries. Replace the allspice with ground cinnamon. When preparing the basic recipe, replace the summer fruits with peeled, sliced, and frozen ripe apricots, nectarines, and peaches. Replace the allspice with ground nutmeg.